It's been over three four decades now since I left the farm, but I've always considered my time there to be a special blessing. Though I often can't remember what happened last week, many moments from those days of old are permanently etched into my memory. 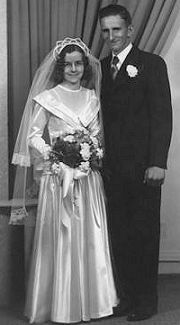 My parents, Clarence Seibel and Mary (Koslowsky) Seibel, were married on December 15th, 1949 and began their life together on 320 acres of rented land just six miles north of Fredonia in southeast Kansas. 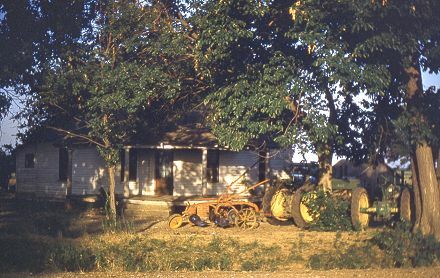 Even before being connected to electricity from the REA, they had everything a young farming couple needed. My father was a hard worker, spending all winter cutting fire wood and hedge posts to supplement the family income. He's often told about working at a brick plant for part of a day, but soon deciding that it was no place for a farmer. I came along the next year. There are many events from the early years that I have heard about, but don't actually remember, like the time a snake was discovered warming himself on the pile of wood behind the Warm Morning woodstove. Or my learning to flip a light switch at the age of 6 months when we first got electricity. Or the time my Mom attempted to give my Dad a haircut. It didn't go quite according to plan, so she stopped halfway through. He headed to town to have the barber finish the job, but unfortunately stopped first at the John Deere dealer, who noticed hair protruding from under only one side of his hat. The whole store was let in on the secret and it was an embarrassing moment. Or there was the flood of 1951 when the Verdigris River came all the way to our little house. Fortunately, flood control reservoirs were soon built that stopped the annual floods. In my memory the vast bodies of water were seen behind a dam, not outside our front door. As always, farmers were self sufficient and resourceful. Water came from a well in the back porch. It was carried into the house and often to livestock as well in buckets. My father had adapted an electric washing machine motor and old car steering gear to pump the handle of the old well pump. Heat came from the wood piled on the back porch. Most of it was Osage Orange, or what we called "Hedge", and burned very hot. One could find the side of his body nearest the stove blistering hot, while his backside was frosty cold from the drafty old farmhouse. Clear plastic was put over the windows each winter to combat the harsh north winds that roared unabated across wide open farmland. We had the necessities of life, but not all the amenities. Until we moved to our own place in the 60's, home heat came from a wood stove. Baths were taken in a galvanized tub behind the stove and an outhouse in the back yard was where we went to the bathroom. Water for the wringer washing machine was heated on a dangerous kerosene stove that once set the wash house on fire. A telephone didn't seem necessary until I moved several states away in the 70's. Air conditioning? What's that? Television was too much trouble until it became clear that I would be spending my career in the business of broadcasting. Sports were considered a waste of time - something that these farmers just didn't have time for. But that doesn't mean that life on the farm wasn't a busy and interesting life. Sunday was the highlight of the week, when we'd go to the Mennonite Church in the big town of Fredonia, and often stop at the Cozy Cafe or the Iceberg for Sunday dinner. For the uninitiated, dinner was the meal eaten at noon - supper came in the evening. Many weeks this was our only venture "into town". Sometimes we'd take a drive up the South Mound for a bird's eye view of the countryside. In the afternoon we'd often take a Sunday drive around the countryside to check out the neighbor's crops, sometimes stopping to visit. The day might end with the family playing a homemade marble board game or maybe a game of dominos. In the early years, in addition to our garden, a grocery store in nearby Benedict was our source of food. We'd stop by with a list and take a seat while the grocer would sack it up. We'd have him put it on the bill, which would be paid when crops were harvested. We had a running tab at the filling station too, mostly for tire repair and the regular Fudgesicle or bottle of pop out of the water cooler. I thought the new banana flavored ice cream bars were the neatest thing, but I was sure our snacking days were over the day my Dad said there'd be no more pop because the price of a bottle went from 5 cents to 7 cents. Most other trips "into town" were in pursuit of parts for a tractor or farm implement, or twine for the hay baler. Gasoline was delivered to a tank in front of our garage. Well, it looked like a garage on the outside, but it was a regular blacksmith shop on the inside. 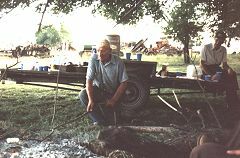 My Dad was one of the few farmers in the area who had a welder and knew how to use it. 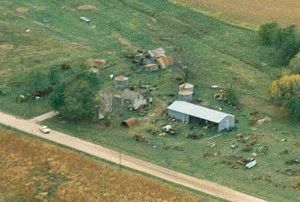 The only reason a vehicle went into the "garage", was for repair, or maybe to protect a truckload of wheat from a sudden rainstorm. 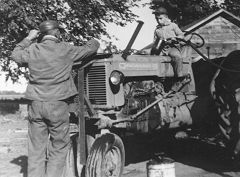 We spent many late nights in the garage, working on a tractor, or organizing and sorting my Dad's collection of bolts, parts and tools. It was on those nights that I learned how radio signals from as far away as Mexico could be heard clearly at night. I was fascinated at how, "XERF in Ciudad Acuña, Coahuila, Mexico," and "Del R-i-i-i-o, Texas," rolled off the tongue of Paul Kallinger as he introduced The Radio Bible Hour with J Harold Smith. The visit by the gas man was always a special event. If nothing else, it provided a pause in the day's work, yet, it has one very sad memory for me. I remember the day that my dad stood and talked to the gas man in the driveway. Our dog Brownie, old and deaf, went to sleep in front of the wheels and never heard the truck start up. On the farm we learned about life and death first-hand. I remember so clearly watching a man skin one of our cows that had died and winching it into his truck for disposal. At the same time, new life was coming into existence all the time. Calves were being born, usually naturally, but sometimes requiring the services of a veterinary. From my vantage point some three feet above the ground, the area on this map seemed to be a vast and endless universe that went on forever. It is amazing today to fly from one end to the other in a handful of minutes and see it as but a small segment of the Kansas countryside. The farm shown outlined in blue is the half section (320 acres) that my parents rented and where we lived until 1967. The farm outlined in red is the 80 acres they purchased in 1960 and where we moved in 1967. My parents continued living there until they retired in 1996. Benedict is the nearest town and where the school bus took me each school day through the 5th grade. I soon had every country road memorized from Buffalo to Buttermilk Hill. The county seat of Wilson County, Fredonia, is where I continued my education and ever longer daily bus ride through high school. 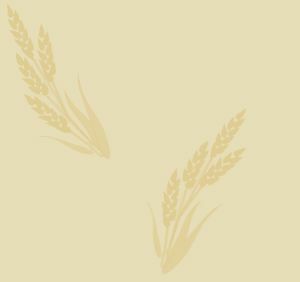 On our farm, we grew mostly wheat, soybeans and milo - what many call maize. I understand that my Dad also raised white corn and flax before my memory. Harvest was a busy, dirty time. The milo was worst, with its extremely itchy dust. 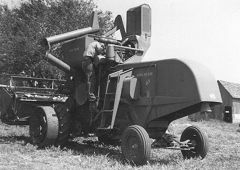 Few tractors and combines had enclosed cabs in those days, so we hoped for winds that would blow the cloud of irritants away. 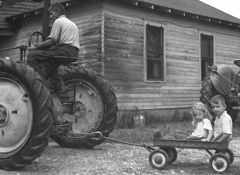 Mud was another problem, so Dad added steel wheels to his combine, to which 2 by 4 lugs were bolted, allowing him to combine when others couldn't. But when he got stuck in the mud, he was really stuck. 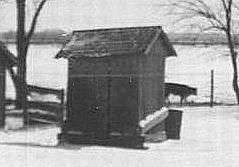 The grain was usually stored in the metal grain bins or an old boxcar sitting south of the house. Other times, if the price was right, it would be hauled directly to the grain elevator on the edge of town. It was quite a sight to see the front of a truck or trailer lifted high into the air and the grain pour out the back into a grate in the floor. There was also alfalfa for cattle feed and a good sized vegetable garden. Twenty acres were left in native prairie grass to be baled for livestock feed. This prairie meadow was a special place that grew wild. We would take on this fortress of nature once a year, with its nests of bumblebees, snakes and other varmints. Many times in spring the old dry grass would be burned off to allow the new to thrive. Sometimes this was a controlled process, and sometimes these fires were set accidentally by the train that daily crossed our farmstead. It was in that meadow that I had an allergic reaction to a bee sting that covered my face with hives and numbness. It got me a trip to the doctor and a bee sting kit that I would carry with me for years to come. Baling hay was not limited to our own meadow. My Dad had one of the Allis Chalmers Roto-Balers that made round bales - not the big ones you see these days, but smaller ones of 70 to 90 pounds. Successfully operating those balers was an art, and he had it mastered. 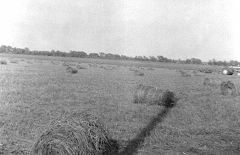 Each summer, when our own work was done, we'd head off to fields and meadows across the county to do custom baling for neighbors. It was a three step process. First my Dad would begin mowing the hay. Next I, and later my sister, would begin raking the hay into windrows. After that came the baling. One advantage of the round bales is that they could stay in the field until needed, eliminating the need to haul them immediately into a barn - so hauling them wasn't a part of our job. One year we made over 25,000 bales. I remember the homemade hamburgers or egg sandwiches that my Mom would prepare for us, and the large metal water cooler that was loaded with big chunks of ice to keep drinking water or tea cool through most of the day. 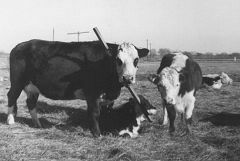 "Judy" Pole chained to her neck helped keep her from going through fences. 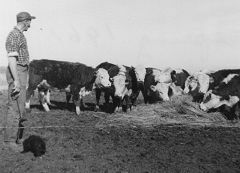 Our livestock consisted of twenty or so cattle that ran in a pasture, raising a calf each year, as well as two or three milk cows that would usually raise several calves bought at the sale barn or from a dairy. An old windmill stood guard over the east pasture, its wind driven pump having been replaced long ago with a gasoline driven one. Still it was the watering hole and gathering place for the herd. On occasion we owned a horse for a short time, and there was always the faithful farm dog and dozens of cats ranging from tame to wild. The livestock are what turned farming into a fulltime job. There were cows to feed and milk every morning and evening. Vacations as we know them today weren't even considered. Our milk cows were milked by hand into a galvanized bucket. Still warm from the cow, the milk was poured through a strainer and put into gallon jars. Opening the refrigerator the next morning, we'd see two inches of pure cream at the top of each jar, waiting to be skimmed off for Dad's morning bowl of coffee. OSHA would have cringed at the electric fence charger we had. It consisted of a surplus neon light transformer that put out several thousand volts. It had a 120 volt light bulb wired in series with the input, which made it lethal only to small animals. When the light lit up, you knew that something had received a serious jolt of electricity. The biggest, meanest bulls could be put in that fence and it would hold'em. In addition to being powerful, the fencer was on continuously - meaning that when one grabbed a hold of the barbed wire with his hand, his muscles contracted from the flow of electricity and he could not open his hand. We had all kinds of notions about how to get loose from its grip - like jumping off the ground to break the circuit. Usually our screams would bring someone running to unplug it before we had the presence of mind to try our theories. 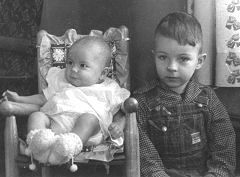 Three days after my fifth birthday, my sister, Eleanor, arrived. I remember pulling up to the doctor's office to bring her and our mother home. She was soon the little blonde girl in homemade dresses following her big brother around. It was great to have a companion to play with. 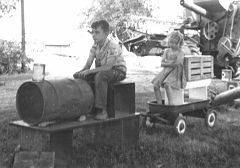 There'd be a few new toys each Christmas, but much of our time was spent creating a fantasy from anything we could scrounge up around the farm. Boards and barrels became a train. Bent spoons became toy plows. A ladder from an old combine became stairs to a tree house in the mulberry tree. Washers and other small objects became play money. God-given creativity was allowed to thrive. I can clearly remember the concern I felt for my little sister the day I came home from school to find that she'd cut her arm on a mower sickle and required eight stitches. I always felt a bit more protective after that. We knew nothing about rush hour. The first traffic lights went up on the town square when I was in high school. There was no such thing as a traffic jam - except maybe at a farm sale where cars were lined up and down the gravel road. When we drove, we took our half out of the middle of the road, staying in the well worn areas. Our progress might be slowed from time to time by coming upon a creeping tractor or combine, or a road grader scraping gravel back into the ruts we had worn. We might have to stop for a big yellow school bus picking up or dropping off kids and we'd pass the RFD mailman making his route to each farm house. The mailman always brought much anticipated letters and the essential Sears Roebuck and Monkey Wards catalogs, the "wish books" from which we did much of our shopping and dreaming. Our main connection with the outside world was the radio. It was a large piece of furniture with a wire running to a window screen for use as an aerial. We started each weekday off with Paul Harvey's observations, followed by news and the all-important weather forecast with Harold Springer coming from KGGF in Coffeyville. It was a memorable day when our grade school took the sixty mile field trip to Coffeyville and I actually got to see the desk where he prepared his news and weather broadcasts. Sundays were filled with gospel music, like the Blackwood Brothers Quartet the Chuck Wagon Gang, and favorite radio preachers like Charles Fuller and Billy Graham. The voices and music coming out of that box always had a special fascination for me, and still do. They were an exhilarating taste of what lay beyond the boundaries of our cozy little existence. I clearly remember KCRB, (now KKOY) in Chanute ending each broadcast day at sunset with Glen Miller's Moonlight Serenade. Most neighbors had television, but we did not. That newfangled invention was very suspect as being a worldly time waster - a suspicion that has not gone unproven. One day when I was a small child, a neighbor came from town with a TV in the back of his pickup. As he and my Dad began to unload it, my Mom proceeded to lock the doors. 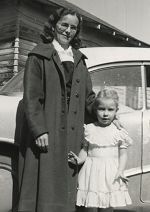 The impressions that were made in my mind that day are still there today - the picture of two grown men carrying that big box back to the pickup and the picture of my five foot one-half inch mother standing up for her principles. She figured a clothes dryer would be more useful. Nevertheless, we'd often go to a neighbor's house on a Sunday evening to watch a fuzzy black and white rendition of Bonanza. Though we didn't take vacation trips, we did occasionally go "out west" to visit family in central Kansas. This was usually a one day trip. We'd know we were well on the way when we crossed the old iron bridge on highway 96 that we knew as "Uncle Jake's bridge." That was followed by a long ribbon of highway, with its occasional ups and downs, across the Flint Hills. Anticipation grew as we approached Marion county where my parents had been born. There would be a day of visiting and eating and then the even longer trek home. Arriving home late at night, there were usually still chores to be done by lantern light. Other times, a flock of relatives would show up at our place for one of my Dad's legendary wiener roasts. It was an all day event that took days of preparation. An area among the trees near the "crick" would be cleared and mowed. Well in advance of the event, a huge pile of wood would be assembled and lit with the assistance of a can of gasoline and maybe an old tire or two. Meanwhile, all the supplies - wieners, buns, condiments, ice tea, and roasting sticks - were assembled on a trailer to be parked at a location upwind from the blaze. Eventually, the roaring inferno would burn down and yield enough glowing coals to roast hundreds of wieners and marshmallows throughout the social affair that often lasted until well after dark. My parents finally retired in 1996 after 47 years of farming and moved to a small apartment in Hillsboro where they were able to enjoy time with grandkids and other family. 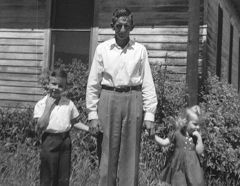 In 2003 my father's health deteriorated to the point he had to be moved to a nursing home, where he passed away on October 9, 2004, making this world poorer and heaven richer. My parents heading for the airport after I circled the house to let them know I had arrived home. Since flying has become a big part of my life, I often try to figure out how that interest was birthed. My mother tells of me seeing an airplane in the sky and asking what happens if the motor stops. I clearly remember a crop duster buzzing back an forth across a field just west of our house - so low, yet in a sky so unreachable. The next thing I remember is listening to descriptions of John Glenn's space flight on the radio an imagining being alone in that small capsule a hundred miles high. I believe that may have been where the fascination really took off. Then one Sunday morning in my dabbling with radio I came across a local pilot reporting the position of a coyote to hunters over a CB radio from his small airplane. Hearing him describe the path of that elusive coyote along a familiar hedgerow, I wondered what it might be like to see my world from above, but doubted I ever would. Later, listening to the live moon landing left me awestruck. We went to a neighbor's house that evening to see the grainy gray pictures coming live from the moon and my heart was no longer in the dirt that my ancestors had spent their lives working. Gene Seibel's book about 24 years of flying adventures over the farms of the Midwest and much of North America. 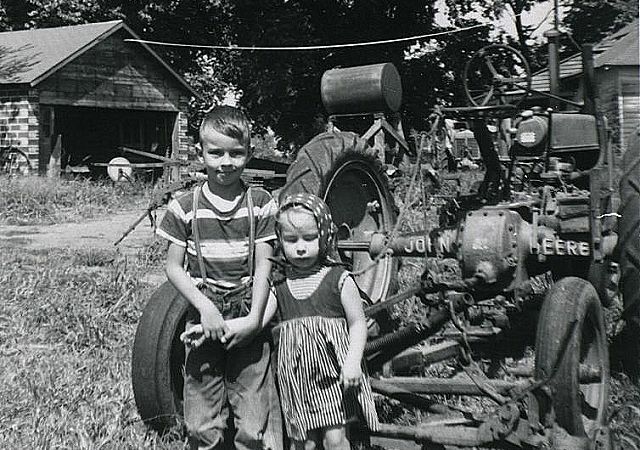 Eleanor and I in front of a Model B Johnny Popper and New Idea mower. This tractor did not have a starter and had to be cranked by hand. These two cylinder tractors could run on kerosene as well as gasoline. The small tank below the steering wheel held a small amount of gasoline for starting. In the background is the front of a 1954 Minneapolis Moline ZB tractor. Notice the foot powered grindstone in the door of the garage and the 200 gallon gasoline barrel on a wooden stand. I remember the electric line in the picture being run to the garage when 220 volt electricity was needed for the new Forney welder. 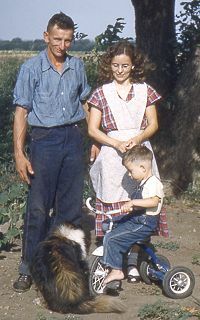 This picture would be from about 1958. Check out my Uncle Louis Toavs John Deere tractor collection! Slides from the early 50's. Fewer than half of these homes are left standing today.